When Kennet Granholm and I organised the 2012 conference on Contemporary Esotericism in Stockholm, and established the ContERN website, we gave our promises that video material from the conference would appear online within a few months. I’m not sure if 14 months can be characterised as “a few”, but in any case: The first material has now been publicized. We started by releasing our own introductory lecture and welcome address. In the short lecture we discuss our reasons for establishing ContERN and organising the conference in the first place, and argue for the need of an interdisciplinary study of contemporary esotericism to take shape. As explained on the ContERN website, the video is a lot more grainy and static than we had hoped for. We originally had two cameras, but the results from one of them unfortunately had to be discarded. Luckily, though, the audio is pretty clear, so we hope that the documentation value is still fair enough as far as the content is concerned. Make sure to check it out if you’ve been curious what was said during the conference – and stay tuned for the keynote lectures, which will be released in the coming weeks! Also make sure to subscribe to the ContERN YouTube channel. 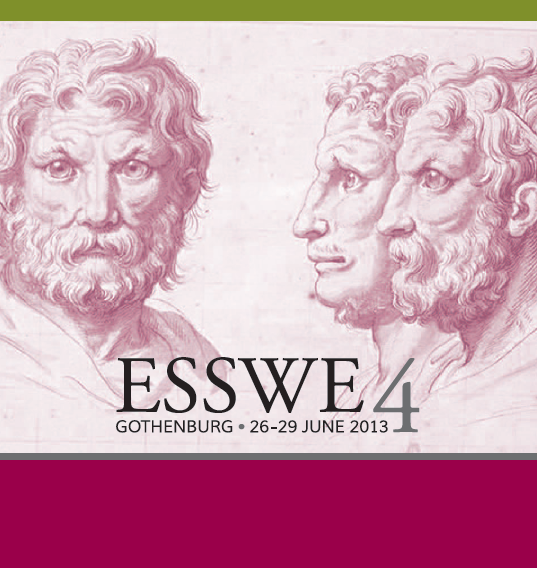 ESSWE4: Gothenburg, Sweden, June 26-29, 2013. I’m only doing one conference this summer season, but that is already turning out to be a massively busy and exciting event. Now that the final program is available, and the book of abstracts can be downloaded, the ESSWE4 conference in Gothenburg, Sweden, stands out as everything that an international conference of the European Society for the Study of Western Esotericism should be: strongly interdisciplinary (the inclusion of historians of science and medicine is particularly noticeable, and a greater number of sociologists and anthropologists is also a highly welcome development), with a rich and varied program that includes panel sessions, discussion groups, roundtables, and keynotes. There is also a dinner in the Masonic Hall and a final esoteric concert event: Genesis P-Orridge and Carl Abrahamsson (known in the esoteric world as editor of The Fenris Wolf) perform live with their act, White Stains. P-Orridge and Abrahamsson will even appear in a half-hour discussion group at the conference itself on the final day, entitled “Music and Esotericism from the Inside Out”. Browse the program on the website to find out more. In addition to that, you should check what people are saying about the event in social media on this Tagboard (join the conversation with the tag #ESSWE4). This promises to be the first ESSWE conference with live twitter feeds to follow, so do check that out and contribute if you are going! (I hear there will be free wifi available, so no need to worry about insane roaming charges) . Heterodoxology has functioned as an unofficial outlet for ContERN news lately; for those who are not primarily interested in news about this obscure network, I apologize. Now, however, I can announce that the Contemporary Esotericism Research Network has finally gotten its own website and blog, which you can check out here. It’s relatively simple for now, but has the essential information about the fledgling network in a concise form. The blog section of the website will now work as a channel for announcing news (I might occasionally re-post here, too). The link section has references to important scholarly associations and societies, departments, and journals that are of relevance for the study of contemporary esotericism. These are obviously flexible lists, and will be modified as we go. Other pages will also be added to the website in the future, with new features and content, so stay tuned! As announced previously, a new network has been created with the aim of placing the field of contemporary esotericism clearly on the agenda of academic research: the Contemporary Esotericism Research Network, or ContERN for short (no connection with the Third International, we promise…). It is affiliated with the European Society for the Study of Western Esotericism (ESSWE), and everyone who participate in our activities is encouraged to become a member of that organisation (which can be done by applying online here). There is currently a Google group which will work as a mailing list and discussion forum for the network (click here to sign up), and also a Facebook group for easy communication. It’s been a long time away from blogging, but for good reason I assure you. While in the middle of moving house I have been finishing my dissertation, a good 600+ pages that will be sent off to committee members on Friday. Now more work awaits in following up on a recent event in Stockholm: as announced many times on this blog, the 1st International Conference on Contemporary Esotericism was held at Stockholm University on August 27-29.